Find hands-on design inspiration and all the elements and surfaces for your new kitchen, bath or commercial installation in our beautiful Design Center located in Lacey, WA. VISIT OUR 5000 SQ. FT. SLAB WAREHOUSE! Whether you visit our showroom, or call ahead for an appointment to meet with one of our professional designers, you'll find that kitchen, bath and home surface renovation and remodeling is as easy as 1-2-3! Simply provide your measurements, hand-select your stone slab, finalize the finishing touches (i.e. sink style, finished edge profile, backsplash, faucet, etc.) and things get underway! You'll find thousands of tile, marble, granite and quartz samples, plus inspiring installations. Our Design Center location is easy to find, with plenty of convenient parking. Our warehouse is full of slabs to select for your next project. Constantly updated inventory allows for making a selection even easier! Browse a beautiful selection of stone slab remnants, deeply discounted and perfectly sized for smaller projects. 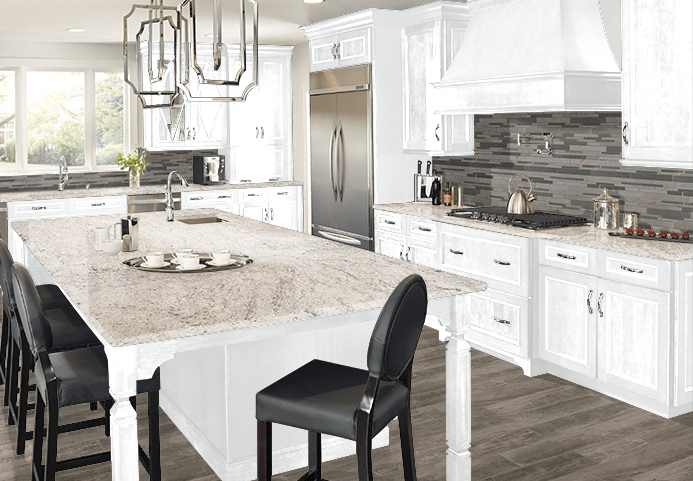 Our talented Designers are dedicated to helping you find the perfect blend of textures, colors and styles for the kitchen or bathroom of your renovation dreams. Stop by our Design Center today, or call for an appointment at 360 459-3000. Most of our clients bring in a cabinet layout or quick sketch of their countertops to our showroom. We can take that sketch, draw out your countertops and create an estimate for you. We provide pricing for materials, template, fabrication and installation. Tops has so many options right here at our Design Center to make your experience the best possible! VISIT OUR FULL WAREHOUSE OF SLAB INVENTORY! Our slab warehouse located in lacey, WA. Inventory updated weekly! OUR DESIGNERS ARE HERE AND READY TO ASSIST! Sinks - from 16 gauge stainless steel undermount sinks to Blanco Silgranit composite sinks, as well as many others. Faucets - all types of styles and finishes on display in our showroom, including Kohler, Moen, Grohe and many more. Air gaps, soap dispensers, garbage disposals, Tops has all of the finishing touches you need! See All of Our Blanco Silgranit Sinks - Click Here! Don’t forget to ask about fixtures. We have it all here at Tops Solid Surface. Stop in to see all the selections and different finish options here at our Design Center!